2011-12 dove and teal hunting forecast. The first two fall hunting seasons opening this month are for the birds — doves and teal, specifically. Other game seasons will be previewed in the October issue. This may sound like a blinding glimpse of the obvious, but Texas needs rain. Badly. The entire state has been devastated by drought for almost a year, and that has affected wildlife. 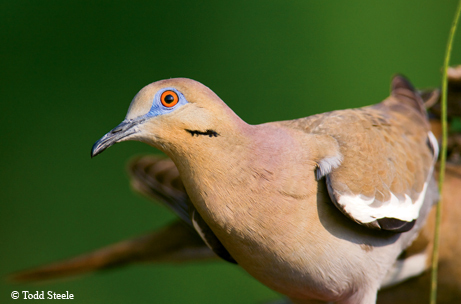 Native dove populations have been hurt by drought, but other factors have had an effect, too. Severe cold and snow caused mortality by preventing the birds from feeding. High winds destroyed nests. Low forb production limited food supplies. Trees not leafing out provided no nesting cover. Wildfires burned nests and even smoked out a number of birds. Fire and ice were a bad combination. “I’ve seen lots of eggs laying on the ground after the storms,” observed Danny Davis, wildlife technician in Ranger. That coupled with the other factors indicates a low hatch among native birds this year. But before you sell your shotgun and invest your birdshot budget in oil company stocks, read on to see what Texas Parks and Wildlife Department wildlife biologists say. There is a glimmer of hope amid the gloom. A rainbow over the drought-stricken state, according to district leader Mike Krueger in Kerrville, is that bare ground often reveals seeds for doves that they would be unable to find in densely vegetated areas. That is true even in burned areas. That helps, because biologists in every region this year reported a lack of seed production affecting food supplies for doves, along with shrinking water sources as ponds began drying up. Todd Montandon, biologist in Canyon, however, pointed out that hunting in the Panhandle is good where there is less water on the landscape — at least for those who still have any water at all. Hunting around water holes should be extremely productive, if the drought persists. Jason Wagner affirms this for the Trans-Pecos, saying that is usually the most productive place to hunt in West Texas. Bird movement also affects hunting. “Like clockwork, there is a front that comes through about September 1 that pushes the local birds further south,” Dean Marquardt reminded hunters. He’s right; it happens more times than not, scattering doves. The northern U.S. nesting grounds have been blessed with rain — some more blessed than they wanted — and that has led to good dove production. A bumper crop could be heading to Texas as the weather cools. That, coupled with increases in white-winged doves in many parts of Texas, could help offset any drought-induced declines in mourning doves. Whether northern birds stick around, though, is another question. “Fall migrations may choose to pass over quickly,” commented Blake Hendon, who works Travis, Hays and Blanco counties. “South Texas holds more migratory birds than any other parts of the state and is not as dependent on local young birds,” David Veale, district leader in Pleasanton, pointed out. “Although native food sources will be lacking,” Uvalde County biologist David Rios explained, “agricultural crops of milo, corn and sunflowers will likely be available to supplement native feeds.” Irrigated farms there in the Winter Garden area make that possible. Ralph Suarez, farther west in Ballinger, however, noted that most farmers in his area are not planting milo this year. Veale concluded by saying that public hunting areas in Frio, Jim Wells, Kleberg and Zavala counties have all been standouts in past years, and could be this year, too. He suggests scouting in advance, however. The permit can be purchased anywhere licenses are sold, but a map booklet of the areas is available only through TPWD law enforcement and wildlife offices or by mail. Maps can also be viewed on the public hunting pages on the Texas Parks and Wildlife Department website: www.tpwd.state.tx.us. All zones have a 70-day season. Daily bag limit will be an aggregate of 15 birds, with no more than two white-tipped doves. 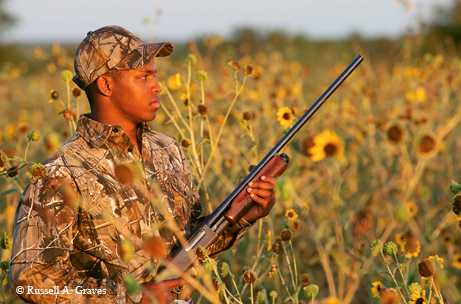 Doves live in Texas, and Texas hunters depend on local, native birds until cooler weather sends migrating mourning doves south. Not so with teal. Almost all of them spend the spring and summer in the north. What happens there doesn’t stay there, though. 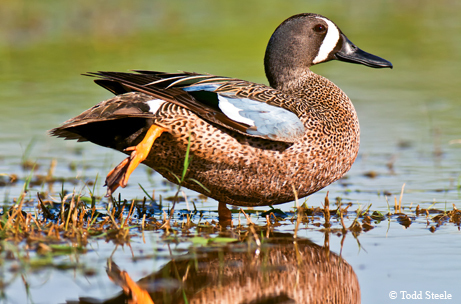 It affects what teal numbers will look like when they arrive in Texas. And this year is looking mighty good, at this point. Conditions across the breeding grounds are bordering on “epic,” according to TPWD waterfowl program leader Kevin Kraai. “The same weather pattern that has been leaving Texas high and dry most of the winter and spring dumped tons of snow last winter and continued as rain this spring on already saturated northern prairies.” Many fields were consequently too wet to plow. It’s all about water. And what’s in it. Jesse Oetgen in Weatherford summed it up. “Dry or partially dry tanks lack the vegetative structure that attracts these birds,” Oetgen says. “By the end of the long, dry summer dominated by a La Niña weather pattern, this water will be gone and teal will pass over the area in search of more reliable water.” According to Kraai, marshes will be salty and reservoirs will be low, making them less inviting. Find one, and you’ll find teal. This year, a season will also be open for Canada geese in the east zone only, to coincide with the early teal season. Small resident populations exist in this zone.